August 23 – for the Samsung fans and other tech enthusiasts it’s a quite familiar and vital day. Of Course, it’s the day in which much anticipated and ‘heavily leaked‘ Samsung’s flagship Galaxy Note 8 will be unboxed. Unfortunately, it seems the event will just stay as an official ceremony by Samsung side. Since, unveiling and unboxing of the device has already done by the leaks, against Samsung’s wish and knowledge. As usual, the infamous leakster Evan Blass was behind this. Always, spoiling the party of Samsung has been his pleasure. It has been only six days past the rendered images by Evan Blass. Today, much more leaked images appeared over the web, to be precise, initially on the My everyday tech. The latest images are similar to those by Evan’s. Interestingly, Samsung responded to the leak and succeeded in patching the hole by shaking hand with the My Everyday Tech. The preventive response from the Samsung is a clear indication of credibility of the leaked images. Unfortunately, Samsung couldn’t stop the forest-fire like expansion of any data over the web. To much fun, the images were already leaked from the leak outlet My Everyday Tech to other leak outlets, before Samsung could think anything. The Next Web has humorously described the scenario as follows: “Samsung is trying to put out a different sort of fire this year”. 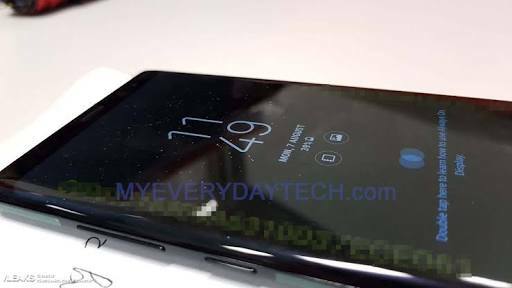 Linking to the last year’s ill-fated and predecessor of Galaxy Note 8, the Galaxy Note 7. Here, below you could find all the leaked images, that Samsung tried to prevent, but in effect gone futile.